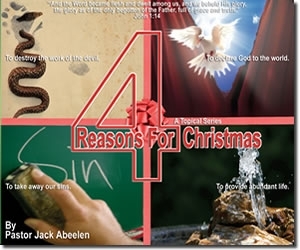 In this four part series, Pastor Jack presents four clear reasons why God gave us Christmas. These biblical reasons stand out in contrast to the secularizing mindset of the world regarding God's gift of His Son, Jesus. This resource would make an excellent witnessing tool to give as a gift at Christmas time.